ED: This post is mislabelled – it was written by Amy Coffey, but posted from the wrong wordpress account. If I say “yeti” you likely think of a white, hairy, apeman – but there’s more to this monster than that. 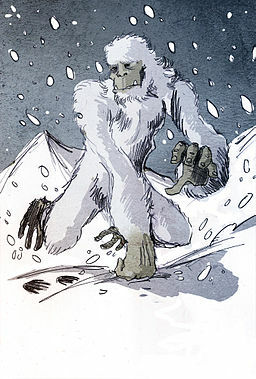 Yeti – also known as the Abominable Snowman – is a monster that is rooted deeply in native Himalayan beliefs, as the monster that will take you away if you go out onto the mountains alone. Over the centuries there have been story told by the Sherpas the people of Nepal, Bhutan,and Tibet. Of a 8ft tall man-bear or wild-man with unthinkable strength and endurance, which lives in the deepest reaches of the himalayan mountains and if you come across them, they will take your innocence, drain your strength and consume youth. Interest in them didn’t start in the west until the mid 20th century when Eric Shipton was searching for a route to scale Mount Everest from Nepal, where he and his sherpas saw footprints in the snow and they said they were made by a yeti. Many theories have been made over the years as to what had made those large footprints and what in fact a yeti is. Some say it is the missing link between man and ape, other say it is a form of ape, or a large species of bear, or even a god of the hunt of a long forgotten religion. Many people believe it to be a very large species of bear that has not been identified, or a crossbreed of a grizzly and polar bear, both seem feasible and make sense since the name “Yeti” itself may come from either “Ya-Dred”, meaning “Rock Bear” or “Yeh-Teh” meaning “Little Man”. Cryptozoologists apply a semi-scientific approach, and tend to support the idea that it is more ape like and maybe even a type of neanderthal, a missing link that we have not found – rather than anything either supernatural, mundane or mythological. Across the world there several forms of this creature that all live in remote place and look like an ape-man-bear thing – there’s the yeti in Nepal, the Sasquatch in USA, The Almasty in Russia, the Orang Pendek in Indonesia and the oddest I’ve found reference to is the Yowie from the Australian wilderness, this is odd since there are no bears or apes in this part of the world the largest mammals are man and kangaroo. It interesting that a very similar myth existed in so many different parts of the world, parts that have no relation to each other. They appear human or ape like, they have flat – snoutless – faces, usually with small eyes, a big flat nose and a pronounced jaw like a gorillas but with sharp teeth. Broad shoulders and a strong muscular chest. Sharp nails on leathery human-like hands. Most have large muscular legs which bring them up to 8ft tall if not more – but the Orang Pendek only stand at about 3ft. Have hair all over which can be any of white, grey, brown or red and sasquatch can be black as well. They’re stronger than any man. They are usually territorial and often hostile but smart, often killing both animals and people. They tend to be found in mountainous areas, thick forests and other forms of harsh wilderness. The stories suggest they have some kind of life draining power. How do work when you cross breed them with other humanoids like elves. Yeti are stealing young girls, why and how do you go about saving them. You could have a quest to collect yeti hides to create clothing that can give strength.